With yet another VC reshuffle, Ron Pryor became Chairman after the 1990/91 AGM, with Alex Morrison as the new VC. Islay and Paddy remained as Secretary and Treasurer respectively. As was said earlier,’to live in Spain, you need to develop a special mentality to deal with bureaucracy; to be able to celebrate if you win and shrug your shoulders when you lose’. In the days of Franco, there was a very small Civil Service, and for tax gathering for example, they would ask the equivalent to the BMA (British Medical Association) to calculate how much all the doctors in Spain needed to pay in tax, and accepted their biased and unscientific calculations. Then along came the Socialists, who employed many people to administer the system, but with no background experience to help them. Each region, such as Valencia, Murcia etc, interpreted the new laws imposed by Madrid in their own way, and once it got incorrectly inputted into their computers, there was no going back. Tony recalls ‘I sold an old banger 5 years ago. They would not accept the licence fee for the new car until I had paid all the old taxes on a car that I no longer owned. Still, not as bad as the man who had the same name as a man who had not paid his ‘suma’ (rates) for four years. The Local Authority sued the wrong person (same name) and subsequently the wrong house was sold by the Court. The owner, who had paid all his taxes, is now trying to get his home back. ​‘A new sport is developing, Basura Hurling, confined to lazy males and those who don’t have their dustbins emptied by the Ayuntamiento. To play, you put your rubbish and bottles on the car floor in front of the passenger seat, (or between the legs of your spouse), and drive as close as possible to your basura bin. lower the window, and hurl your rubbish straight up into the air to land safely in the bin’. ‘Score 10 points for each successful drop, but minus 20 points for falling short and dropping it into the road, plus the embarrassment of having to get out in front of the other waiting cars and pick it all up. A tip. Make sure that you have no wet stuff in the bottom, for as you drag it over your clean shorts, it will make a mess to say nothing of the smell’ . 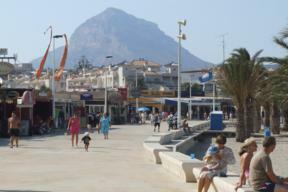 This is the forth of a series of articles on the history and development of the Costa Blanca 41 Club. It is being compiled from a large number of newsletters recovered from files held by Tony Ogden, who played a major part in the development of the Club and later in the development of the group of clubs now known as the ‘Iberian Cluster’. All the text above in italics is directly quoted from newsletters published at the time, and the web posting and additional illustration images are provided by Gordon Macnab. 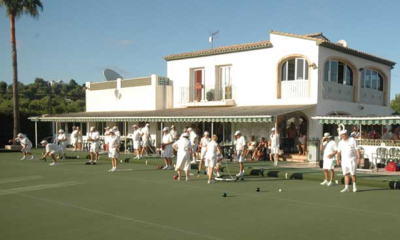 meetings moved mainly to the Javea Green Bowling Club. Social activities became a well organised and important part of the Club’s programme, at a mixture of venues still including member’s homes. 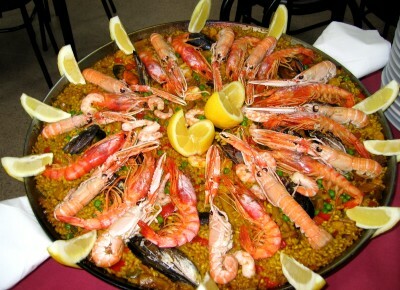 A local fisherman and his mate, were asked to cook paella for 44 people at the side of the pool. The day before, he arrived, found a suitable place under an olive tree, put a few ‘bloques’ around, and left two very large pans. About 10.00 am the following morning, he dropped off lots of beans, tomatoes and huge quantities of garlic, then disappeared until 11.30 am when he returned with large quantities of fish, chicken and lamb’. Then they started. Mussels cooking in one pan, garlic in another, then in went the meat, fish and rice. There were masses for everyone, even surplus prawns. All agreed it was the best paella we had tasted. Another first was a progressive supper, which finished at the home of Terry and Beryl Loftus’ for desserts, coffee and cognac.’ It was alleged that Tony’s directions sent one member and his wife to the wrong address for their main course, superbly coped with by the hostess. He reports ‘we had the most delicious bubble and squeak for the next four days’.